When the personalized craftsmanship of an artisan is discovered, that creator either retains his or her exclusivity or succumbs to the royalties of mass production. Kalon Studios has grown steadily since its inception in 2007, but greater accessibility through technology-assisted production has not compromised the artisanal spirit that originally distinguished the brand. 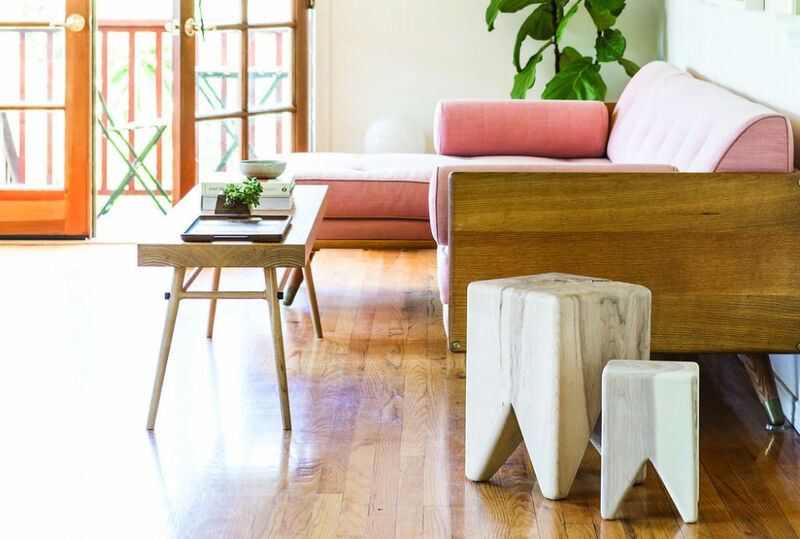 Founded by husband-and-wife designers Johann Pauwen and Michaele Simmering, Los Angeles-based Kalon Studios focuses on sustainable solutions to modern living using versatile, elemental forms. Kalon’s timeless furniture—its founders’ intent is for customers to enjoy these pieces for a lifetime as trends come and go—is manufactured by a small team of craftsmen with timber sourced from sustainably managed forests. The products of Kalon Studios tend to appeal to trend-conscious consumers, but trendiness was never a value the founders felt comfortable with. “I don’t think that we’ve ever sought out being unique. Innovation for innovation’s sake isn’t interesting to us,” Pauwen says. “We try to create work that people respond to and can live with. I think that we try to create honest work—honest work for honest people. Pauwen notes that most technological advances influence the design process. “We’ve become quite comfortable modeling in 3D, which allows us to experiment with far more iterations of an idea than if we had to physically build it every time,” he says. The low-slung, clean-lined Simple Bed ($2,895-$4,995) is a study in sleek modernism; it’s available in ash, walnut and other woods. Representative of that philosophy is a minimalist dining room table ($2,200-$3,895) from the Isometric Collection, available in various hardwoods. It is built by Mennonite craftsmen in Pennsylvania, but its sleek good looks are reminiscent of midcentury Scandinavian design. The Wilderness Collection is a fun, rustic line of kids furniture. “We wanted the qualities of self-reliance and wilderness to enter into kids’ fantasies and their sense of play,” says Pauwen. Kalon offers a stunning maple Echo Crib ($1,295)—it was the couple’s very first design for their own daughter—that converts into a platform bed when the occupant outgrows it. “The creative energy is great,” Pauwen says of Los Angeles and California. “It’s very removed, intellectually, from what’s going on in the rest of the world.” He’s delighted with the freedom currently enjoyed in L.A. However, the couple see the city as changing and caution that its creative energy should not be taken for granted—that it could be lost amid unbridled economic success. Kalon Studios recently launched the Bough Collection, inspired by Japan’s sashimono woodworking tradition. Featuring solid ash and cast-iron hardware, the line juxtaposes heavy slabs of wood with slender, sculpted legs. The crossbeam of the Bough Table ($5,800) features blackened- steel hardware that contrasts dramatically with the bleached ash. It can be paired with matching benches ($1,800 each) that easily double as coffee tables. “Our customers are looking for highly considered pieces for their homes—something with a sense of serenity, with engaging details to be beautiful and interesting,” Pauwen says.